Want to share your collage on Facebook or send a greeting card by email? That's a matter of a few mouse clicks. Photo Collage Maker lets you export your creation to any popular image format: JPEG, PNG, GIF, BMP, or TIFF. If you are creating collage designs for your website or blog, keeping a reasonable image size may be crucial as you want your pages to load fast. 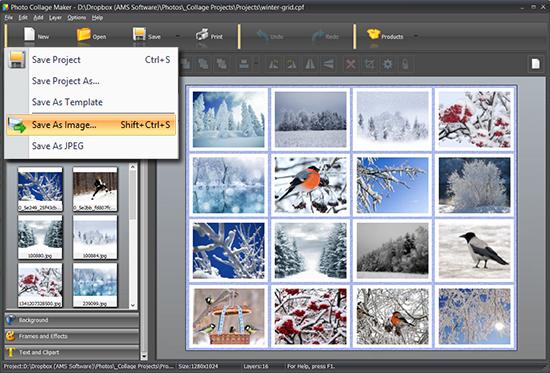 Photo Collage Maker enables you to save optimized JPEG, considering the output file size and the image quality. You will find this option if you choose Save As JPEG in the export options list. 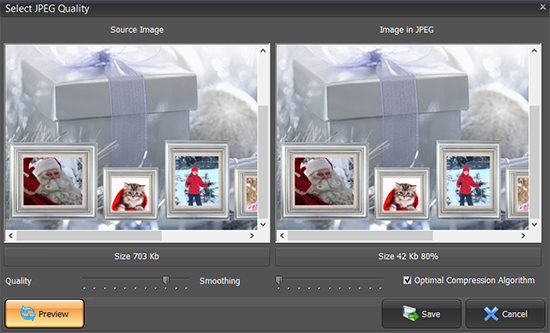 While saving optimized JPEG you can control the file size and preview the resulting image to make sure it looks great.